National Poetry Month is almost over; given how big a role poetry plays in my intellectual life, I wanted to devote some time to one that I’ve been thinking about for a little while. A friend sent me this poem as an example of the sort of thing she had trouble understanding. M. is very intelligent and educated, but more toward the hard sciences than in the humanities. I’ve no notion of writing some critical manifesto, but it may be that some of you who read this will find it useful to see a process of interpretation. 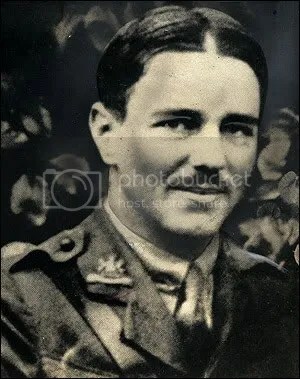 First off, this is from Wilfred Owen. He’s one of my favorite modern poets (modern in the sense of cultural movements, anyway; he died almost a century ago). For my money he wrote the best English war poetry of any era. Even this short poem set on a British street is informed by his experience of war. The narrator sets himself apart from the men he observes with “they” and “those”: “they” are a happy crowd walking eastward to meet their wives at home, and by implication our speaker is not. He sees himself as a wanderer following dangerous dreams whose only chance to enter that domestic world of the first stanza would come by “daring to go side by side with”–who? A soldiers’ sweetheart as literary convention perhaps, though I find it more likely that Owen is alluding to romantic desire for his hero, the handsome, renowned poet Siegfried Sassoon. And then there’s this third stanza. What an odd turn this is; try as I might, I cannot make satisfactory sense of that first line, “Or be you in the gutter where you stand”. The standing figure holding “news of all the nations” must be a newsboy; he is fixed to the spot as he sells his wares, but like the speaker he too is aware of the world outside domestic bliss, aware of the tragic stories he sells. I THINK Owen linking this figure to the object of desire in the second stanza with that “or be you” line, but I can’t quite work out the detail. So, not one of Owen’s best poems, but certainly a touching little piece–I particularly like “tiring after beauty through star-crowds” as a description of a restless young man. It’s also nice to see Owen deal with something besides the horrors of war. You really were an English major, weren’t you? I am humbled.